Anthony Rais is a multi talented entertainer. In his unique marionette presentation, Rais shatters the stereotype of kiddie puppet shows, elevating a centuries old art to new heights. His peers have honored him with heartfelt accolades and standing ovations. 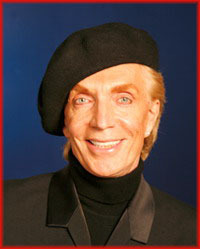 Rais is no stranger to the Las Vegas Strip having performed as a featured specialty act in an extended engagement of “The Magic Of Paris” in the Paris Las Vegas Casino. Anthony has performed with Lance Burton in the Monte Carlo Casino, and with magician Nathan Burton at the Flamingo Hotel Casino. Other major strip hotel guest appearances include the Venetian, Tropicana, Four Seasons and Ballys. From Las Vegas to Dubai, conventions to galas, he has enchanted and delighted audiences of all ages with his marionette artistry. He was one of a select few invited to participate and perform in a prestigious conference of world renown puppeteers held at the Eugene O’Neill Theatre in Connecticut. Stretching the limits of puppetry, Rais, an accomplished figure skater, introduced his marionettes to the ice stage in a production of “Magic Ice Rainbow” earning rave reviews. In the Boston Ballet’s gala production, “Oui Can-Can You,” Rais’ Marionettes delighted special guest, Princess Grace of Monaco. His characters are hand crafted with special attention to detail. Costuming, music and lighting create a unique entertainment experience that never fails to delight. Just as Cirque du Soleil redefined and reenergized our concept of “circus,” this marionette production brings a fresh, new vitality to an irresistible theatrical genre. One really gets caught up in the personalities of the characters, completely forgetting that they are wood and string. One of Rais’ featured marionettes is Totolino. Under his masterful manipulations this endearing clown transcends the fine line between fantasy and reality. The presentation is evidence of Rais’ painstaking attention to movement, expression and detail. Amazingly life-like, Totolino will amuse you, he will charm you, and ultimately he will tug at your heartstrings. The end result is nothing short of genius. For a whimsical interlude, Rais created Rigga More-Tease. She could certainly qualify as the world’s oldest dancer. She will tease your mind and tickle your funny bone with her spicy striptease. This “bone-a-fide” lady leaves nothing to the imagination as she has already taken it all off! In his belief that animals rule the world, Rais introduced Sweetie, the canine version of everyone’s best friend. Sweetie truly inspires “puppy love” which motivates her fans to adopt a homeless pet. CLICK HERE TO SEE ANTHONY IN LES CONTORTIONETTES.